Julianne Hough, Maksim Chmerkovskiy & More Step Out for Industry Dance Awards 2018! Julianne Hough is the lady in white as she hits the red carpet at the 2018 Industry Dance Awards held at the Avalon Hollywood on Wednesday (August 15) in Los Angeles. 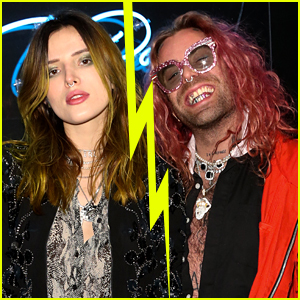 The 30-year-old entertainer was joined at the event by Maksim Chmerkovskiy and his wife Peta Murgatroyd, Stephen “tWitch” Boss and his wife Allison Holker, Jenna Johnson and her fiance Val Chmerkovskiy, Tina Landon, Paula Abdul, Travis Wall, Sharna Burgess and JoJo Siwa. Julianne was at the event to present her friend, choreographer Kyle Hanagami, with an award. The Industry Dance Awards & Cancer Benefit Show is an annual event that brings the global dance community together in celebration of creativity, industry innovation, and the fight against cancer. FYI: Julianne is wearing a Cushnie dress and Eva Fehren jewelry. Jamie Dornan Gets Up Close & Personal with Fan in 'Ellen's Twister Hunky Hoopla Game - Watch Here! Jamie Dornan‘s flexibility skills got put to the test while making an appearance on The Ellen DeGeneres Show, airing on Wednesday (January 31)! 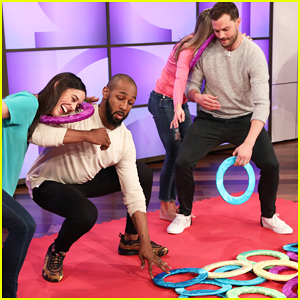 The 35-year-old Fifty Shades Freed star and Ellen‘s DJ tWitch teamed up with audience members Tracy Worley from Akron, OH and Margie Latondre from Glendale, CA to play a game of Twister Hunky Hoopla, where they had to get up close and personal with their bodies in many ways. Jamie also sits down on the couch with Ellen and admits he starts to panic when he meets Fifty Shades fans who think he’s actually Christian Grey with his own Red Room . “I’ll be at a line for Starbucks or something and someone will be like, ‘oh, Mr. Grey’, and I’ll literally be holding one of my children,” Jamie said – Watch more after the cut! Photos: Michael Rozman / Warner Bros.
Nicole Richie Gets a Dance Lesson From tWitch on 'Ellen' - Watch Now! Nicole Richie is busting a move! The 36-year-old Great News star made an appearance on The Ellen DeGeneres Show on Friday (January 19). During her appearance, Nicole told Ellen about her son Sparrow‘s bearded dragon, Speedy, and how invested she’s become in taking care of the reptile. Nicole also embarrasses her kids with her dances moves! Ellen set her up with tWitch to learn how to break it down. FYI: Nicole is wearing a House of Harlow 1960 x Revolve skirt. Jessica Biel Does 'Dirty Dancing' Lift on 'Ellen' & It's Amazing - Watch Now! Jessica Biel may have made the best entrance on The Ellen Show ever! 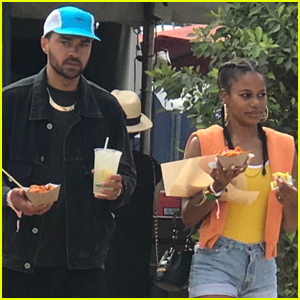 During her appearance, the 35-year-old actress entered from the audience and met Stephen “tWitch” Boss, Ellen‘s DJ and a professional dancer, at the bottom of the steps. They then did the famous Dirty Dancing dance to “The Time of My Life,” where tWitch lifted her in the air – just like Jennifer Grey and Patrick Swayze. Jessica also talked about her TV show The Sinner and her hubby Justin Timberlake on the show.